The Dalek was built by Robin Burchill, 18, from Bride, and was being operated by his girlfriend Nina. in a news story, you just have to delve deeper. And not do any obvious women driver jokes. broke when it hit a pothole on (FTTH-free zone) Ramsey Promenade in the Isle of Man. This isn’t “news”. I’m pretty sure this sort of thing happens worldwide on a daily basis. 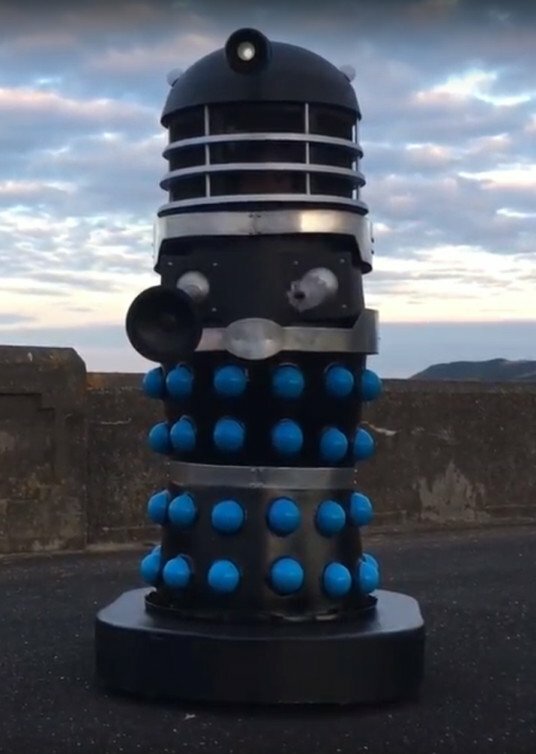 Upon completing my Dalek, I decided to take it for a test run on Ramsey Promenade. We decided to take it from the promenade over to Mooragh Park as there were a few more people over there, when crossing the road towards the park’s car park driveway, the Dalek fell into a pothole. A test run for what? Are you planning some sort of invasion, Robin? Why go towards the people, Robin? People are scared of Daleks. I’ve seen Doctor Who – those wheelie bins with laser guns are dangerous. Were you putting some sort of evil plan into practice here? Unfortunately, when the Dalek hit the hole, it caused significant damage, its head came off, its eye was smashed and the dome suffered a nasty gouge. Robin said both of these were quite large and fairly costly repair jobs. Both three of them? Right. He said that he had contacted Ramsey Commissioners to inquire about compensation, as the road had remained in a state of disrepair for a while. Worth a try, I suppose. I wonder if they took the claim seriously? 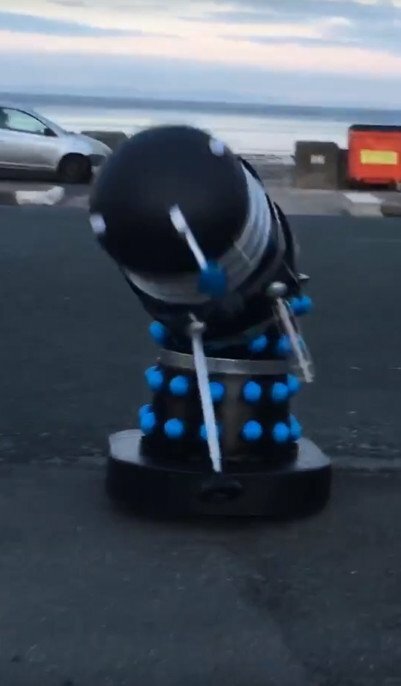 Ramsey Commissioners told the Manx Independent that they had not heard about an incident involving a Dalek. And it’s really the sort of thing you’d probably remember, isn’t it? Robin says that he is more concerned about the possibility of an elderly resident crossing the road on a mobility scooter and fears they could be injured. Of course you are, mate. And you were going to put your compo towards that, weren’t you? Not towards building another bloody Dalek or anything. Ain’t no compassion like faux compassion.